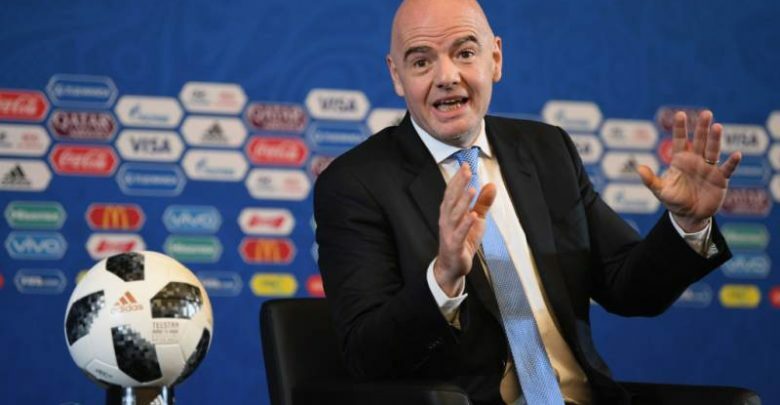 FIFA president Gianni Infantino has leaped to the defence of the 2026 World Cup bid process as the world federation published the bid books submitted by both contenders Morocco and United (United States/Canada/Mexico). FIFA Congress is scheduled to stage a decisive, open vote in Moscow on June 13 but if both bids are to make it that far they must pass muster with a five-man evaluation taskforce whose own work has become increasingly contentious. Supporters of the Moroccan bid from within the African confederation CAF have questioned its credibility after the modus operandi appeared to change along the way. The taskforce will provide marks on five major factors and could thus rule out any one bid even before it comes before FIFA Council for review on the eve of congress. A voting option to abstain has thrown a further complication into the political mathematics. His words will be widely weighed considering the scandal which surrounded the last bidding procedure which concluded, in 2010, with the contentious awards of the World Cup to Russia in 2018 and Qatar in 2022. He added: “FIFA has been heavily criticised for how it conducted the selection of hosts in the past; it was our obligation to learn from this and leave no room for any doubt or subjectivity. “This is why the rules of this process have been clear and objective from the beginning, and they include the highest standards in terms of ethical conduct, participation and commitment to sustainability and human rights. Infantino’s statement followed revelations of unrest within FIFA Council over the powers of the evaluation panel. All along Infantino has insisted that this time around the process must be “bullet proof” but the evaluation panel is coming under increasing verbal gunfire ahead of the decisive vote on the eve of the 2018 Opening Match. Infantino is considered to be privately favourable to the United 2026 bid and these suspicions were strengthened when FIFA barred Morocco from presenting its bid to the African confederation congress in January. Anger at perceived interference from ‘FIFA Central’ erupted because the desist order was issued just an hour before the scheduled presentation and in the same week that United 2026 leaders presented their own rival credentials to leaders of the southern African COSAFA grouping. FIFA rushed out a retrospective clarification about promotional and presentation activities but too late: the damage had been done. Suspicions about the taskforce agenda in the Francophone world increased after details emerged of the assessment which derogated an effective power of bid rejection to the taskforce. This prompted a row in FIFA Council two weeks ago in Bogota. CAF president Ahmad questioned the apparent new powers of the taskforce, prompting a vote on the authority of the panel. A vote produced 17 in favour while the six African delegates present voted against. American Sunil Gulati and Canadian Victor Montagliani (FIFA vice-president and CONCACAF supremo) recused themselves while the eight European delegates abstained. While the vote confirmed the work and power of the evaluation taskforce it could not be described as a vote of great confidence. This suits outsider Morocco whose bid officials – as reported here previously – have always viewed the evaluation as crucial. While United 2026 can point to great strength in the power of infrastructure already in place, the Moroccans believe they are developing a solid groundswell of voting support. They also consider the ‘Trump factor’ as increasingly playing into their hands. ** The evaluation taskforce comprises joint deputy secretary-generals Marco Villiger and Zvonimir Boban, audit chair Tomaz Vesel, governance chair Mukul Mudgal (India) and competitions committee delegate Ilco Gjorgioski (Macedonia).